How do we know Barack Obama is a huge sports fan? Well, he discussed the matter with the editor of this site. You probably saw that. So Obama is a huge sports fan. What’s interesting is that the White House talks so relentlessly, and self-consciously, about Obama’s fandom. Spikes the football, to borrow a recent D.C. catchphrase. In this, Obama has started to sound a lot like a certain former fan in chief. Not the Texas Rangers co-owner. Nor the Michigan Wolverines center. No, Obama has started to sound a lot like Richard Nixon. Obama and Nixon are soul mates in their need to tell voters, “I am a sports fan!” If you understand why Nixon had to talk about sports, you begin to understand why Obama does, too. Let’s stipulate that every American president calls himself a sports fan. He throws out the first pitch, he brings the champs to the White House, he might even preside over something called Operation Wide Receiver. But ever since he was a would-be candidate, Obama has launched a sort of national sports ad buy, chiseling the fan-in-chief mantle into our psyches. Obama had his sports powwow with Bill Simmons. In 1968, Nixon had his sports powwow with — wait for it — Hunter S. Thompson. The good doctor, who’d been picked from the press pool because he was the only one “seriously addicted” to football, got an audience with Nixon on a bus ride during the New Hampshire primaries. Thompson mentioned a wide receiver that had caught a pass in Super Bowl II. 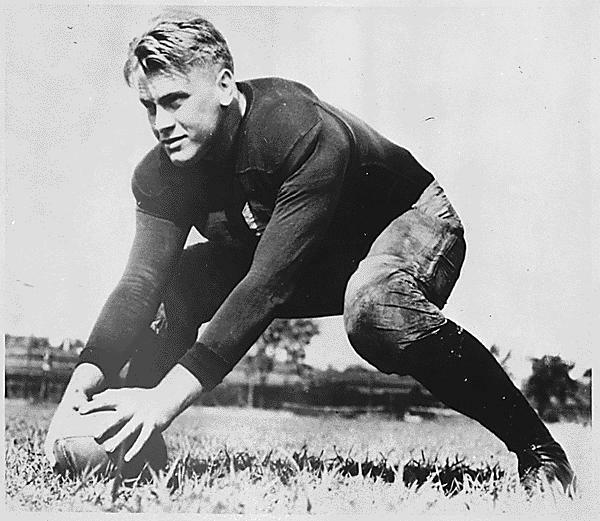 Nixon stunned Thompson not only by naming the receiver but his alma mater. “Whatever else might be said about Nixon — and there is still serious doubt in my mind that he could pass for Human — he is a goddamn stone fanatic on every facet of pro football,” Thompson marveled. We nod when Obama name-drops Jared Sullinger. But Nixon could go full nerd, too. His former aide Monica Crowley says he summoned the names of old ballplayers like he remembered faces on a rope line. In 1972, a reporter asked Nixon to pick his all-time Major League Baseball team. Well, Nixon did more than that. He emerged from his man cave with four all-time teams: American League (1925-1945), National League (1945-1970), and so on. Yes, Obama quizzed Phil Jackson about the triangle offense in 2009. But it was Nixon who often called the home of Redskins coach George Allen, invited him to White House parties, and scrutinized his offense.5 And Nixon led the league in sports-as-war metaphors. Why’d they talk up their fandom? Well, part of the Nixon mythos goes like this: He was a runty backup on the Whittier College football team, he got knocked around, and he spent the rest of his life as a jock-sniffer. “It’s said that we’re all failed baseball players,” says George Will. “He was a failed football player.” Obama is also a failed athlete. Really. Despite the constant refrain that Obama is a “great basketball player,” he’s better described as a midlife enthusiast. He rode the bench for his high school team (Hawaii state champs, but still). He has nothing in the trophy case to match, say, Craig Robinson and Arne Duncan. Like most of us, he failed. Years later, Obama called his high school career a chance to learn “that not everything is about you.” But in Obama’s manic desire to schedule games, in his I’m-only-sorta-kidding boasts about his own game, you see a smidge of Nixonian regret. You see a senior year getting replayed past age 50. If sports talk helped soothe old wounds, it gave something else to Nixon and Obama: It gave them the language of Joe Sixpack. David Greenberg, author of Nixon’s Shadow, says that during the 1969 Moratorium to End the War in Vietnam, Nixon announced he’d be home watching college football — you know, like a real American. Yet a year later, when Nixon visited protesters before dawn at the Lincoln Memorial, college football was one of the only things he could think to bring up. Obama doesn’t share Nixon’s awkwardness with voters, but he’s sometimes accused of talking in an academic drone. No one says that when he’s talking about Derrick Rose. But I think Nixon and Obama got something even bigger out of being sports freaks. It allowed them to go one-on-one with their most deadly caricatures. Before his 1968 campaign, Nixon was cast as an inhuman pile of ambition forever molting into a “new Nixon.” Obama, way more slanderously, has been called a Kenyan-born, madrassa-schooled non-American. It’s no wonder the POTUSes never shut up about sports. Nixon talked football and got to be part of the silent majority. When Obama talks sports, he shows America his birth certificate. Nixon picked Arky Vaughan because he’d been a high school classmate. Nixon may not have called a famous reverse play.